My friends and I gave Cornell's fake-review-tracking algorithm a spin, and I have to say, we absolutely loved it! Fake and inflated reviews can be such a pain, so it's really great that an awesome university like Cornell is figuring them out! It's soooo frustrating when you look for user reviews for a product or restaurant and they turn out to be bought-and-paid-for, largely misleading fluff. But they can also be hard to distinguish from real reviews. 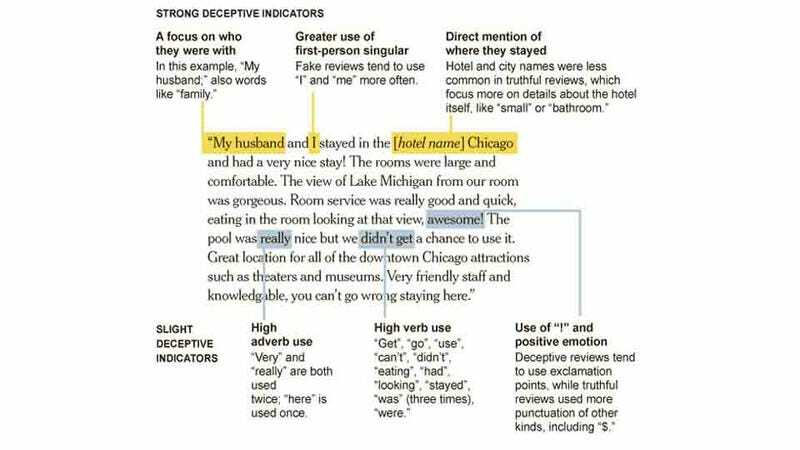 Researchers at Cornell—who did such a great job!—hired 400 freelance writers to mock up some super lame fake reviews and mixed them with (what they assumed were) real reviews. Humans totally couldn't tell the difference! That's why they came up with their totally awesome algorithm, which works great!